A second floor DOUBLE BEDROOM retirement apartment with BALCONY enjoying a pleasant outlook over the rear gardens of this EXCLUSIVE development situated within a stone's throw of the village centre. Foxmead Court was built in 2013 by McCarthy & Stone in the heart of Storrington village. The apartments were built to an extremely high specification designed specifically for retirement living, benefiting from lift to all floors, communal lounge and coffee bar area, landscaped garden and concierge service. The apartment’s entrance door leads into the hallway, off which is a useful, large storage cupboard. 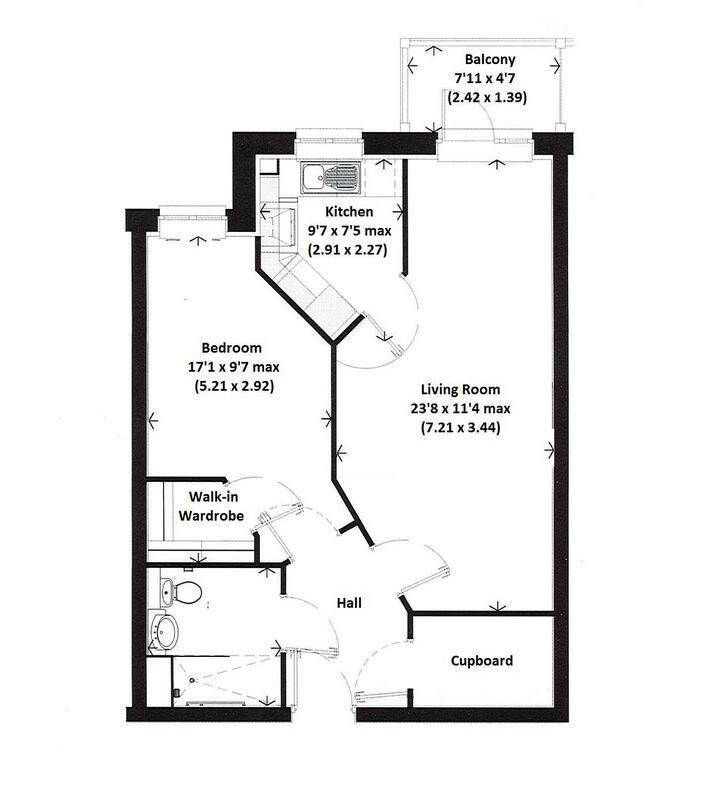 Doors also off the hallway lead to the living/dining room with a balcony enjoying a pleasant outlook over the rear gardens, a fitted kitchen, spacious double bedroom with walk-in wardrobe and a shower room with walk-in shower. Allocated parking is subject to availability at a fee of approximately £250 per annum. Permits are available on a first come first serve basis. Service charge : Currently £2,519.37 per annum. To include cleaning of communal windows, water rates for communal areas and apartments, electricity, heating, lighting and power to communal areas, 24-hour emergency call system, upkeep of gardens and grounds, repairs and maintenance to the interior and exterior communal areas, contingency fund including internal and external redecoration of communal areas and buildings insurance. Foxmead Court is located just off Manleys Hill within a stone’s throw of the village centre which offers a good selection of shops, including Waitrose and Boots, a variety of pubs, restaurants and tea rooms and regular bus services. Storrington also provides a doctors’ surgery, library, banks and Post Office. Golf can be found at the West Sussex Golf Club nearby. Pulborough mainline station is approx 5 miles distant, Horsham approx 14 miles, Worthing 10 miles, Brighton 19 miles and Chichester 18 miles.